Vaishali Rao focuses her practice in two primary areas: first, defending companies in regulatory investigations and litigations brought by governmental bodies; second, compliance counseling related to statutes intended to protect consumers. She has advised a range of financial institutions—small and large banks, online lenders, and fintech businesses—on these issues and also maintains strong relationships with Illinois banking regulators. Regulatory Investigations & Litigation Defense. Vaishali defends companies facing inquiries, requests for information, subpoenas, civil investigative demands, supervisory examinations, or lawsuits brought by government entities like state or municipal regulators, state attorneys general, the Federal Trade Commission (FTC), and the Consumer Financial Protection Bureau (CFPB). Vaishali has extensive knowledge and experience resolving complex unfair and deceptive trade practice cases either through litigation or negotiated settlements. She is also skilled in the drafting and implementation of agreements or court orders requiring substantial business reform. Compliance Counseling. Vaishali helps companies identify and manage risk by counseling them through issues intersecting with consumer protection. Those topics include: Fair Credit Reporting Act (FCRA), Truth in Lending Act (TILA), Telephone Consumer Protection Act (TCPA), state telemarketing laws, federal and state privacy requirements—including Illinois' Biometric Information Privacy Act (BIPA)—data breach management, student loan licensing, and other state law requirements. As a complement to risk management, Vaishali drafts opinion letters, and seeks formal or informal interpretative opinions from government agencies. Prior to joining Hinshaw, Vaishali devoted her practice to public service in the Consumer Fraud Bureau of the Office of the Illinois Attorney General. Pharmaceutical and health care products, drugs and medical devices. 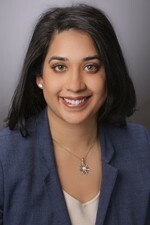 As Assistant Counsel in the Illinois House of Representatives, Vaishali assisted in the impeachment trial of former Illinois Governor, Rod R. Blagojevich. She also managed and analyzed legal issues for members of the House of Representatives, including assisting them with presentation and defense of bills on the House floor and in Committee. Vaishali is the founder of the Chicago Bar Association's Regulatory & Compliance committee. Vaishali co-founded SAPNA Magazine, an e-zine for South Asian American women. She served as the magazine's Strategy Director for six years. She was the Founder and first Chair of The John Marshall Law School's Diversity Affairs Committee.